By the end of the 1920’s Finland Steamship Company’s legendary captain and advertising manager Arnold Neumann faces a big dilemma: The rivalry with the German shipping companies was tough as nails. What to do? The answer was found – once again – in the hands of the poster makers. 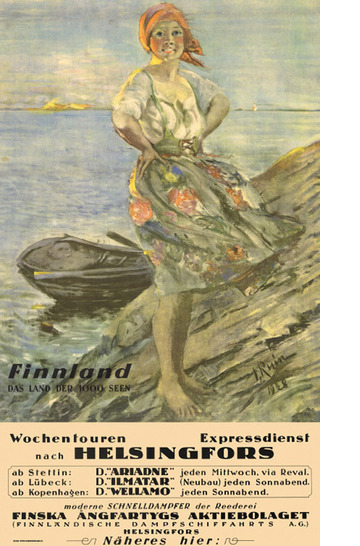 Neumann contacted the Finnish artist and archipelago expert Ingrid Ruin (1881-1956). The job was to paint an archipelago maiden. ”This is worse than a naked pin-up girl”, the letters which landed on the captain’s doorstep screamed. Furthermore: The picture is “incredibly immoral” and it is ”indecent”. But as always happens, people calmed down on this matter. 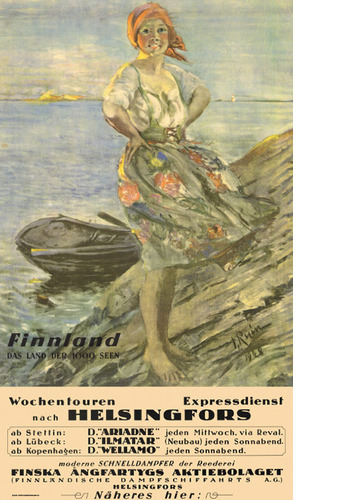 When Ruin painted two more posters, one with the archipelago maiden happily rowing away in her rowboat, the moralists had found other things to be outraged about. The modern man may wonder what was wrong with the picture? The answer: Too much – way too much – bare skin on the legs.